Statewide student results on the standardized tests measuring knowledge of the Common Core standards were essentially flat in 2016-17, after a year of strong gains. 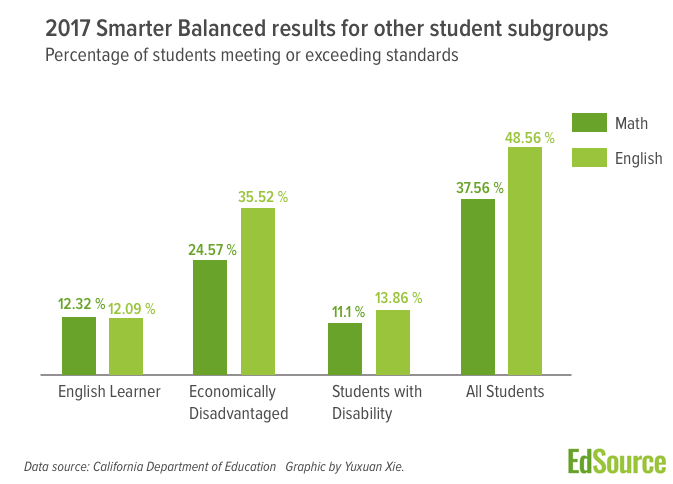 Both EdSource and the California Department of Education report the 2017 Smarter Balanced results by school, district and student group. EdSource’s database makes it easy to search and sort for results by performance and to compare schools within districts. Graphs show performance for all three years of the tests by ethnicity and other student groups. The state’s test results are part of the California Assessment of Student Performance and Progress website; it includes useful information on the tests and downloadable research files. 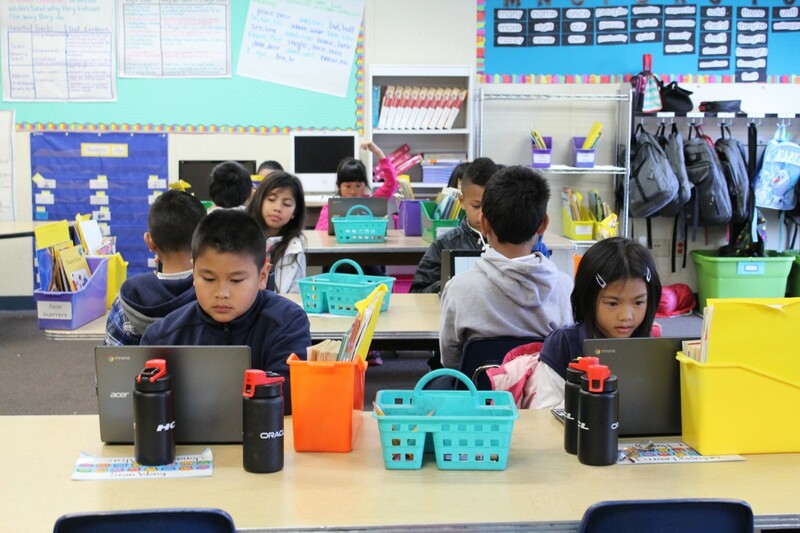 The California Department of Education released scores for the third year of the Smarter Balanced assessment on Wednesday, about a month behind schedule. The results for all of California’s nearly 1,000 school districts, 11,000 schools and individual student groups can be found and compared on EdSource’s Smarter Balanced database. About 3.2 million students in grades 3 to 8 and grade 11 took the tests, as required by federal law. In math, 37.56 percent of students were proficient in math, which was about a half-percentage point increase over a year ago. Proficiency is defined as meeting or exceeding standards, the top two of four achievement levels on the Smarter Balanced grading scale. California State Universities and many community colleges use the results on the 11th grade tests to gauge students’ readiness for college-level work. In 2017, 28 percent of juniors were considered ready and 32 percent were considered conditionally ready with reading, writing and research skills; 13 percent were considered ready and 19 percent conditionally ready in math. The combination of minor gains and losses put students 4.6 percentage points above 2015, the first year of the test, in both math and English language arts. But flat scores in 2016-17 compared to the year before also meant there was little progress in narrowing a cavernous achievement gap between the lowest and highest performing student groups. Only 31 percent of African-Americans and 37 percent of Latino students met or exceeded standards for English language arts in 2016-17. That compares with 76 percent of Asian and 64 percent of white students (see chart for full breakdown). 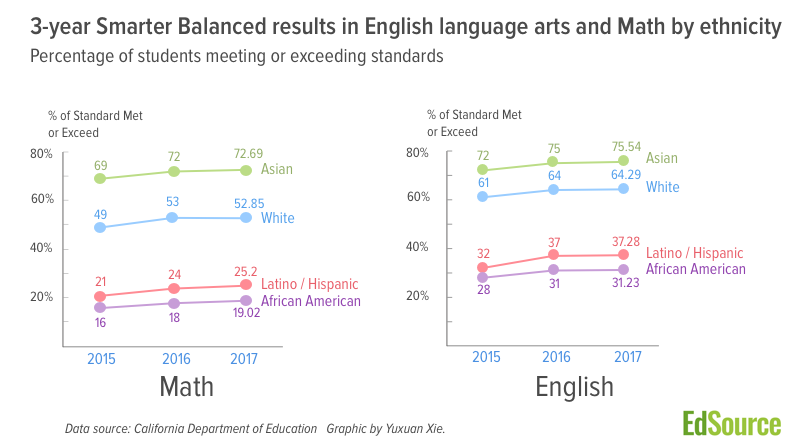 The gap slightly widened for the state’s 1.2 million English learners, with about a 1 percent decline, to 12 percent meeting or exceeding standards in English language arts results. This group contains current English learners only. Once English learners become proficient in English, they are no longer included in this classification. In a statement, State Superintendent of Public Instruction Tom Torlakson characterized a lack of improvement this year as maintaining progress from the year before. “I’m pleased we retained our gains, but we have much more work to do,” he said. Others were more critical or said it was too early to judge. “You should not make big policy judgments based on limited data, and test scores are limited data,” said David Plank, executive director of Policy Analysis for California Education, or PACE. “It would be an error to conclude after three years that academic standards have failed or the Local Control Funding Formula is not accomplishing its purpose” of directing additional resources to the state’s low-income students and English learners, he said. But some superintendents who did see improvement this year attributed progress to specific actions that their districts took. “We believe the work we’ve done around early literacy is starting to pay off by 3rd and 4th grade, in terms of comprehension and reading endurance,” said Matt Navo, superintendent of Sanger Unified in the Central Valley, where 90 percent of students are low-income. Reading scores increased 1.5 percentage points to the state average of 48 percent meeting or exceeding standards. Math scores rose 2.5 percentage points to 2 percent above the state average. But 5th grade made remains “conceptually difficult,” he said. Teachers have expressed frustration over the “robust conceptual understanding and reasoning” that is well beyond what’s been asked before. Only 31 percent of 5th-graders met or exceeded standards. Using additional money under the funding formula for after-school interventions and regular use of the computer program STMath. McKinley Elementary, where about 92 percent students are low-income, and 36 percent are English learners, did all of those and other things, said Principal Scott Tardibuono, and the school raised the percentage of kids meeting or exceeding standards 24 percentage points, from 24 to 48 percent in reading, and 14 percentage points, to 38 percent in math, in 2017. Tardibuono used money he controls under the funding formula to lower class size in 5th grade the past several years, and students working in small groups developed problem-solving skills in math. But another difference, said Kate Pekar, McKinley’s teacher on special assignment, involved changing students’ mindsets, based on the writings of Stanford University Professor Carol Dweck, to help students believe in themselves and their ability to try harder. “McKinley had been low-performing school, but we convinced families and students it didn’t have to be that way,” Tardibuono said. Plank and Bookman noted that the new accountability system had not kicked in to prod districts to improve. But that’s about to change. This year’s test results will be among factors used to determine whether districts and low-performing student groups, such as low-income students and English learners, will receive assistance from the county offices of education. Before the adoption in 2013 of the Local Control Funding Formula, standardized test scores were the sole gauge of a school’s and district’s performance as measured by the Academic Performance Index. The funding formula established a broader set of measures of school performance, including students’ readiness for college and careers, school climate as measured by suspension rates and student engagement as measured by chronic absenteeism and graduation rates. Test scores and other performance indicators will be included in the color-coded “dashboard” ratings that the state Department of Education will release in early December. However, the percentage of students who meet or exceed the standards, while easy to explain, won’t be the measure the state will use to determine dashboard performance. It will use the distance on the scoring scale above or below Standard Met. The state has not yet made that calculation. English language arts scores in all of the other 13 states administering the Smarter Balanced tests also experienced a decline in the percentage of proficiency, ranging from 0.6 percent to 2.3 percent. For math, there were both gains and declines among those states (see state by state breakdowns). Edward Haertel, professor emeritus at the Stanford Graduate School of Education and a specialist in assessment, wrote in an email that uniform declines are unusual and raise questions about the test itself. 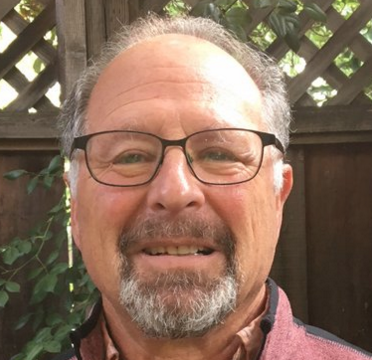 “Here in California, Ze’ev Wurman’s work shows that the 12 years of reasonable standards and state enforcement actually did reduce the achievement gap and in the right way. Scores for “minority” groups went up significantly, while scores for others were roughly unchanged. As you know, I was on the Common Core Validation Committee, so I had a first row seat to what was happening. You should have seen the sudden increase among the math educators involved – when Ze’ev’s results first appeared – in their desire to get rid of the CA standards. I had a long argument with the most well known among them. I focused on explaining our results in eighth grade algebra which had shown a very high percentage of those minority kids passing the course and scoring pretty well on the state exam. Not long ago California was on the right track; it was so unsettling to see how quickly and easily that progress was derailed. Since “nothing changes if nothing changes,” and ineffective change results in worsening of outcomes, then it is obvious that either nothing significant has really changed in classrooms or else the changes that have been made were ineffective – Band-Aids instead of major surgery. LCAPs give some idea of what is transpiring in schools, but probably are misleading in many cases, since the name of the game is often “Write It Down If It Makes Us Look Good.” Lip service is given to highly recommended programs whether or not they have actually been implemented with fidelity (e.g. restorative discipline), and stakeholder engagement is measured in numbers of parents attending open houses, not parents/teachers at the decision-making table. Similarly deceptive, adoption of new instructional materials/programs is documented with no indication of the actual quality of classroom instruction by fully competent staff. What we do know is that test scores of Asian and White students far surpass those of Latino/Hispanic and African American students. We have clearly not learned how to change this – or else we have not chosen to make changes that would reduce the gap. It is always easier to just keep on doing what we are accustomed to doing – behaving as bureaucratic institutions. Between 2000 and 2005, California was on the right track and showing unprecedented gains in student achievement especially in low-income, high-poverty schools. Our standards were second to none, and we adopted two excellent reading programs for K-6 students. President Bush’s Reading First was modeled after curriculum frameworks and training programs based upon current and confirmed research developed here in California by administrators, coaches and teachers who knew how to teach reading. The statistics of all these numbers should be handled with some care. Remember that the way these numbers are handled is that a raw score for each student is generated, then the scores are divided into four categories based on the distribution of the raw scores, and then we are reporting the percentage of scores in each bucket. Reading scores increased 1.5 percentage points to the state average of 48 percent meeting or exceeding standards. Doesn’t quite mean what it implies. That is, for example, raw scores in total for students could be either up or down. 1.5% more students got into bucket 3 or 4. But, it could also be that fewer are in bucket 4, that many went from bucket 2 to 1, and that students had higher or lower scores within the buckets. Also hidden in that statistic could be a big positive change that nevertheless didn’t move many students across the bright line cutting off bucket 2 and beginning bucket 3. If the same number of students score in bucket 2 we call that the same result even if thousands of students went from the bottom of bucket 2 to the top of bucket 2. Some schools that might have similar percentages in each bucket may have much harder lifts than others. These scores are very blunt instruments. They’re interesting and useful but I hope we tread with care before making huge pivots in policy on generalized reports. We’ve made significant changes in curriculum k-12 and that foundational work, plus the work to transition from one standard to the new, does take some time. Students themselves also change year to year, as do the external pressures on them. You’re right, el. The emphasis for the dashboard is the growth in the average scale score, not the percentage of students who jumped an arbitrary line into Level 3, the Met Standards band. The dashboard will give credit to schools that increased their scale scores substantially but still did not make Level 3. El, I couldn’t agree more with your comment. Speaking of huge pivots in policy, here in San Francisco, the district made one of the biggest policy shifts possible. It eliminated tracking concurrently with implementing Common Core and also dispensed with math textbooks in favor of proprietary instructional materials. As you know we have the largest achievement gap of any urban district in California and our African and Latino students have historically underperformed those in Los Angeles Unified. The latest SBAC results have African-American students performing worse than in 2015 with the Not Met category increasing. Your analysis notwithstanding, the results give a very unbecoming snapshot of an ominous trajectory. Caroline, testing is part of government accountability on the part of school districts which receive almost half of all the money collected from the people of this state. If you believe in equity, you need to know how students are doing comparatively. Here is the link to the full document, Doug.